Skintight spacesuits may give future astronauts a moreflexible - not to mention stylish - way to explore the moon and Mars. Researchers at the Massachusetts Institute of Technology(MIT) are edging closer to a spaceworthy astronaut garment that replaces thebulky traits of current, gas-pressurized versions with flexibilityand mobility. Dubbed BioSuit, the spacesuit design relies on mechanicalcounter pressure rather than the stiff pressurized vessels employed byastronauts in space today. "You can't do much bending of the arms or legs in thattype of suit," said Dava Newman, an MIT professor of aeronautics andastronauts leading the research, of current spacesuits used in Earth orbit. Newman and colleague Jeffrey Hoffman, a former NASAastronaut and spacewalker, have been working with students and the design firmTrotti and Associates for seven years to build a viable BioSuit. 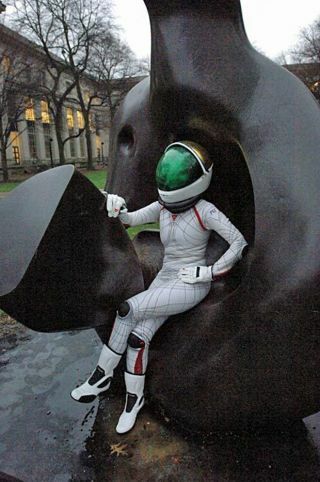 A current prototypeof the suit consistently exerts pressures of about 20 kilopascals on itswearer but newer models have reached pressures of up to 25 to 30 kilopascals,which is about one-third that of the Earth?s atmosphere and the target forspaceworthy BioSuit, researchers said. A fully functional suit could be madeready for spaceflight in about 10 years, they added. At the heart of the BioSuit is mechanical counter pressure,which uses tightly wrapped layers of material that are both flexible andprotective to the astronaut inside. The suit?s layers are wrapped in ameticulous fashion -- based on three-dimensional maps of the human body inmotion -- to provide structural support while maintaining mobility, researcherssaid. NASA?s current Extravehicular Mobility Unit (EMU)spacesuits, as well as their Russian Orlan counterparts, surround theirastronaut wearers in a stiff, pressurized vessel containing breathable air.Added outer layers of material, as well as a backpack-mounted life supportsystem, can further restrict the spacesuit?s mobility and require astronauts tospend the bulk of their energy fighting their own garments while toiling inspace. Both the EMUand Orlan spacesuits are designed for work in Earth orbit, not for use onplanetary surfaces like those of the Moon or Mars, where walking -- notfloating -- will be key. ?We really must design for greater mobility and enhancedhuman and robotic capability," Newman said. Newman hopes the BioSuits could be tailored to offer varyinglevels of resistance to their wearers for use as exercise garments forastronauts on long flights to Mars, as well as athletes and those requiring aidto walk on Earth. The promise of mechanical counter pressure space garmentshas not missed NASA's eye. In early May, the U.S. space agency offered up a $50,000cash prize for anyone capable of demonstrating a homebuilt version of aspacesuit glove using the technology during its Astronaut Glove Challenge. While the $50,000 prize wentunclaimed for lack of entrants and was rolled over to 2008, a $200,000 pursefor a more conventional space glove went to Maine engineer Peter Homer.